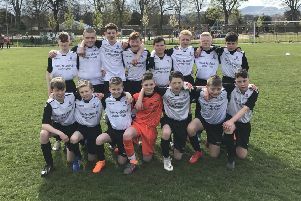 Tynecastle Under-13s booked a place in the semi-finals of the Stewart Brien Cup after overcoming Salvesen 5-0 in a match which was closer than the scoreline may suggest. The game remained even until the 25th minute when Alex McNaughton managed to squeeze a shot under the keeper and the ball dribbled over the line. Minutes before half-time, Tynecastle doubled their advantage when Mitchell Crichton struck past the on-rushing keeper from the right edge of the box. Salvesen had plenty of possession but were struggling to convert chances into goals as Charlie Mitchell and Miko Brown watched their efforts drift high and wide. It was end-to-end action in the second-half, but there was not another goal until ten minutes before the final whistle. Substitute Blair Rennie took a touch to set himself up inside the box and fired into the top left corner. Two minutes later Rennie had the ball in the back of the net again and with only a few minutes to go, Rennie completed his hat-trick by blasting high into the goal. Salvesen showed great tenacity throughout to chase the match, but they couldn’t reduce the deficit. • Edinburgh United U-15s beat Gala Fairydean at Paties Road and advance to the semi-final of the Division 2 League Cup. United found themselves 1-0 up at the break as Fraser Macrosson bundled the ball over the line. The second-half saw United score two further goals from Dillon Walker and Kais Safdar, but undaunted by the task ahead, Gala continued to press forward. They were a constant aerial threat and scored twice in quick succession. Finlay Wheelans and Thomas Chandler were the scorers to set up a nail-biting end to the game. In the final few minutes, Kye Jones scored a fourth for United and despite both teams again going close, the game ended 4-2. Tranent Colts defeated Cavalry Park 4-3 in the Division 3 League Cup to reach their first ever cup final. Cavalry Park started the sharper of the two teams and scored two goals within the opening ten minutes. This only seemed to strengthen Tranent though as they created a number of chances and Jake Brown pegged one back for his side before half-time. The second-half saw Tranent start on the front foot. Dylan Brown equalised and then Alex Courtney scored to take the lead on the 60-minute mark, only to concede almost straight away. Numerous chances were created by Tranent, but solid defending by Cavalry Park held firm until a well-worked move led to Courtney finding space and coolly slotting home to seal the win. • Hutchison Vale Colts U-14s progress to the semi-final of the David Innes Cup after a convincing 3-1 win over Gala Fairydean. Hutchie were trailing 1-0 within five minutes after a spectacular dipping shot from Gala’s Russell Kerr crashed into the net. However, it wasn’t long before the game was levelled, a low strike from Moray Bean on 15 minutes beat the Gala keeper. In the 50th minute, Hutchie’s Lewis Munro fired a low strike into the right-hand corner of Gala’s goal giving the home side the lead. Hutchie were rewarded again for their endeavours five minutes later when substitute Scot McLachlan drove through the Gala defence and thumped the ball into the roof of the net.